Streptonigrin (Fig. 1), a metabolite produced by Streptomyces flocculus, was first isolated by Rao and Cullen (1959–60). 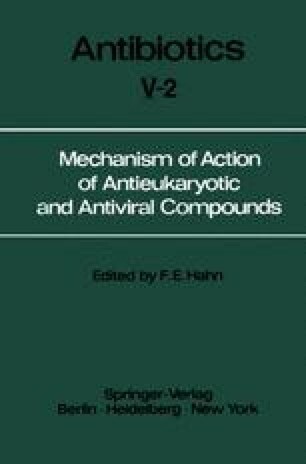 Its activity as a broad spectrum antibiotic was summarized in a previous review (Bhuyan, 1967). A method for the biological assay of streptonigrin in biological fluids based on its antibiotic activity against Bacillus subtilis ATCC6633 has been developed by Pittillo and Woolley (1974). Exposure to streptonigrin caused a first-order decline in the viability of bacteria, implying that only one hit per cell is required for lethality (Levine and Borthwick, 1963 a). Streptonigrin is also an excellent inducer of bacteriophage production in lysogenic bacteria while inhibiting the net synthesis of host DNA (Levine and Borthwick, 1963 a; Muschel and Schmoker, 1966). A marked increase in genetic recombination was observed during a mixed bacteriophage infection in presence of the drug (Levine and Borthwick, 1963 b).